I just got the ICC's latest call for "proposals" for the 2018 International Conference on Creationism, which you can find at the ICC website. The proposal deadline is January 31, 2017. John Whitmore from Cedarville University is going to be handling the General Editor's duties this time. God bless you, John. That's a lot of work.They're asking for "proposals" this time, which are a bit more elaborate than the abstracts they used to ask for. This time, they want the keywords, author's bio, suggested reviewer, and references along with the 300-800 word abstract.The most surprising development is the "submission fee:" A non-refundable submission fee of $25 (per proposal) will be charged whether your proposal is accepted or not. The money will be used to help offset clerical expenses for editing the proceedings. Wow. 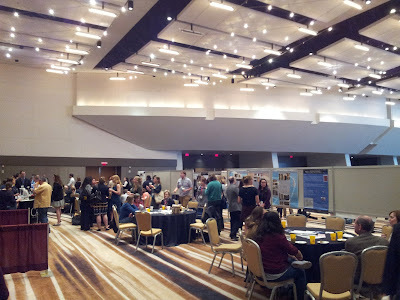 I had some interesting feedback from my comments on the AAPA conference I attended in Atlanta. Before that, let's admire my cool new key chain that I picked up at the exhibitor booth for the Kenya National Museum. 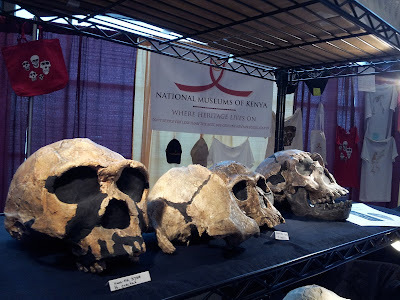 Yes, the very same Kenya National Museum that put the KNM in KNM-ER 1470! They had full-sized casts available too, but I was on a budget. Even though it's tiny, my new skull is pretty neat. My keychain actually has relevance to one of the more curious comments I got. One reader enjoyed reading my comments because I didn't sound like an average creationist. I admit that stung a little (I should sound like a creationist, right? ), but it was meant as a compliment. I wasn't prattling on about evolutionary indoctrination or constantly reassuring my readers that evolution was false or something like that. In fact, I was probably just as excited to be there as anyone else (hence, the keychain story). Origins 2016 abstracts DUE Friday! Don't forget that abstracts for Origins 2016 are DUE this Friday! If you're planning to go, make sure you have your abstract in by the deadline. I'm working on mine (cooking up a little something with Homo floresiensis), and I hope to see you there. For more information, click below! What a day! This was my first day at an anthropology conference, and I spent the entire morning in a session called "Hybridization in human evolution: What can other organisms tell us?" The emphasis was definitely on other organisms. I heard the Grants talking about the finches, which was quite similar to the talk I heard them give back in Ottawa at Evolution 2012. Deja vu all over again. Core Academy's 2016 Smoky Mountain Creation Retreat was another great success. Once again, we gathered with our friends at the Beech Mountain Lodge in Beech Mountain, NC. 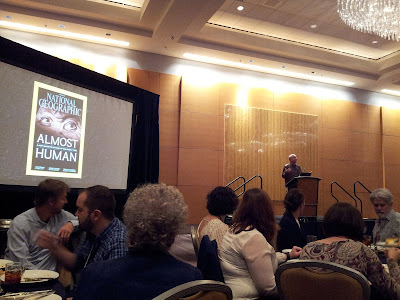 Our theme this year was human origins. We spent a lot of time looking at fossil replicas and talking about Homo naledi. We spent even more time just chatting. The point of the event is not to be a conference with presentations but to be a casual gathering where we can relax and talk and brainstorm. I understand there was a conversation about trilobites that went to 6 am the first night. I'd love to tell you about all the brainstorming, but some of it will just have to be a surprise. (After all, what happens in Beech Mountain stays in Beech Mountain.) My conversations ranged from human disease to San Andreas (the movie) to textbooks to hominins to technical articles to pterodactyls to prayer requests to seminary professors to people we wished were there.